I was in Glasgow at the weekend for the 2017 Glasgow Coffee Festival, but before I travelled back down south, I spent Monday visiting some of the coffee shops that had sprung up since my last visit, back in 2015 for the previous Glasgow Coffee Festival. Chief amongst these is The Cran’, a delightful little spot in Finnieston, at the eastern edge of Glasgow’s west end, which opened at the start of this year. Occupying a long, thin space running along Argyle Street, The Cran’ (which is named after the local landmark, a large crane on the banks of the Clyde) offers an interesting range of vegan food, cakes, loose-leaf tea and some excellent coffee on espresso and bulk-brew from a rotating cast of roasters, all served in a quirky space which reflects something of the history of the building it occupies. The coffee-side of the operation is run by Gillian, who I first met in Avenue Coffee’s Great Western Road branch when she was a barista there. She was originally brought in by the owner, Aziz, to provide training, but when he saw how good she was, he immediately invited Gillian to run the coffee part of the business. The Cran’ occupies a fantastic space, with windows all along the front. You enter via slightly recessed doors towards the left-hand end, while the counter’s at the right-hand end. Although quite shallow, high ceilings, an open, uncluttered layout and the multiple windows, give The Cran’ a sense of space, which is partly down to the minimalist seating. There’s a bench outside on the busy Argyle Street, while inside it can seat maybe twelve people. Immediately to the left of the door, tucked in by a cashpoint machine, is a narrow bench table with a pair of chairs. There’s another opposite the door, with two more chairs, and a third along the back wall with a four-seater gym bench, complete with cushions for seating. On the other side, there are two more chairs, backs to the window/door, one of which is a rather lovely rocking chair. Fast-forward 30 years and we find Aziz renovating what will become The Cran’, stripping it back to the exposed brick and bare stone of the original walls, where he found, to his surprise, an old fireplace, a fireplace that was full of sticks… Aziz also removed a false ceiling, opening it up to the rafters and uncovered the wooden floorboards. When it comes to running The Cran’, Aziz takes a back seat. Along with Gillian, there’s a manager, plus two others, each focusing on their own speciality (cake and food respectively). Together, they also cater for events such as weddings, The Cran’ showcasing their combined services. Gillian has a free hand to run the coffee side of the business, rotating roasters every four/five weeks. The aim is to have a different roaster on espresso and filter, although at the moment Dear Green is on both, with a Guatemalan (espresso) and a Brazilian (filter). However, for the day of my visit, Gillian had a very special Fazenda Chapada from Brazil, roasted by Steampunk Coffee. I say special, because Gillian had competed in the Scottish heat of the UK Barista Championship the day before at the Glasgow Coffee Festival, using that very coffee. It was her first time competing and she finished in a very creditable 8th place, behind such luminaries as Brew Lab’s Claire Wallace (a finalist last year, who finished 7th) and 6th-placed Darryl Docherty (recipient of this year’s Beyond the Bean Barista Bursary). Naturally I had to try it, Gillian making me a lovely, creamy flat white using unhomogenised milk from Mossgiel Farm (which had been exhibiting at the festival), served in an exceptionally pretty cup. The coffee and milk went really well together and they also complimented the lovely, rich, walnut brownie that I had with it. With a slightly gooey centre, it had an almost melt-in-the-mouth chocolaty richness. I finished things off with an espresso, using Avenue Coffee’s latest decaf Colombian. Gillian had remembered that I really like decaf and was keen to show this one off and quite right too. It was really lovely, well-balanced, but with a well-rounded acidity. 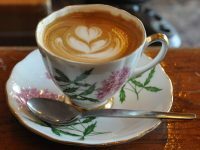 If you liked this Coffee Spot, then check out the rest of Glasgow’s speciality coffee scene with the Coffee Spot Guide to Glasgow. If you’d like to know more about Gillian, who runs The Cran’s coffee operations, then try this interview, part of an awesome series by Scotland Coffee Lovers on women in speciality coffee in Scotland. This entry was posted in Breakfast, Cafes, Cake, Glasgow, Laptop Friendly, Lunch, Sandwiches and tagged include by Brian Williams. Bookmark the permalink.